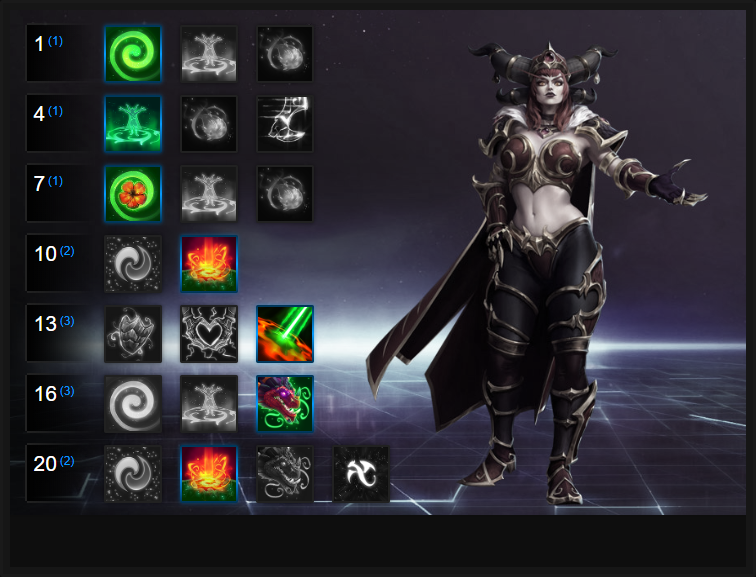 In this Alexstrasza Build Guide, we provide an overview of her strengths, abilities, talents and matchups. Alexstrasza is a unique Support Hero and the first in Heroes of the Storm that heals based on a percentage of maximum health. In simple terms, thinking of it as the reverse of Heroes such as Tychus (who deal damage based on an opponents maximum health). Simply put, she heals an ally for for more based on her current health. The downside to Alexstrasza is the fact she has to sacrifice health in order to heal. While she can't kill herself by doing this, it does mean that there's a constant need to monitor your health and positioning in order to not leave yourself too vulnerable. What's undeniably valuable about Alexstrasza, besides her high healing output, is the fact that her Trait significantly improves her abilities. With every single one bolstered, it can significantly improve her team-fight potential. Although Dragonqueen has a cast time, Alexstrasza can cast it fairly easily. It's at this point that she can often turn any team-fight in her favor. I will note that similarly to Ana, Alexstrasza is incredibly vulnerable to dive compositions and despite a valuable slow in Flame Buffet, her inability to heal herself outside of Abundance often sees her reliant on a second Support Hero. That said, if she has a strong frontline and a pair of Warriors that know how to protect her, she can be incredibly powerful. Dragonqueen (Trait) - Allowing Alexstrasza to transform after a brief period of time, Dragonqueen allows all her abilities to become empowered. Not only that, but she gains crowd control mitigation, ensuring that any cast her way are significantly reduced. With a lengthy cooldown, Dragonqueen cannot be wasted. Ideally you want to use it during a team-fight, specifically when fighting over an objective or during a push on a structure. The high healing and damage Dragonqueen provides for 15 seconds can often ensure Alexstrasza can turn the tide of a team-fight. Just be aware that you can still die when being focused, and even with the additional health-pool, you aren't indestructable and should still position yourself behind your frontline. Breath of Life (Q) - Your primary heal, Breath of Life allows Alexstrasza to heal for a high amount of health (based on her current pool). When in Dragonqueen form, Alexstrasza does not sacrifice health so can afford to be liberal with its application. Considering its cooldown, always ensure that you heal an ally under pressure, and feel free - if you can squeeze it in - to top-up the rest of your team. During your Trait's duration, you'll only be able to cast a Breath of Life 5 times. Preservation (W) - Healing for an enormous amount (30% of a Heroes maximum health), Preservation is a delayed heal that can bring your team back from the brink. The delay in its healing does mean that you need to predict what the enemy will do, or where your team will be, but if you can plant the seed in a location your team can huddle around, it's invaluable. Wing Buffet (E) - Allowing Alexstrasza to knock enemies back, Wing Buffet in Dragonqueen form acts similarly to Mighty Gust. Ideally you want to use Wing Buffet when an ally is under serious pressure, or when the enemy team attempt to dive you. It's also worth using just before Dragonqueen ends just to buy you some time to escape once your transformation ends. Gift of Life (Q) - As your primary heal when in human form, Gift of Life causes Alexstrasza to lose health but returns this to an ally, multiplied by 150%. There is undeniably a risk versus reward element to Gift of Life and while it heals for a great deal, you leave yourself vulnerable if it's used too much. Considering Alexstrasza can only heal herself with Abundance (which has a lengthy delay and huge cooldown), she needs to judge when to best use Gift of Life. If you're in a double support composition, you can afford to be much more liberal with its use. If you aren't, take care and be sure to not leave yourself too low on health: it leaves you super vulnerable to dive. Abundance (W) - I'll admit that I've found Abundance challenging to use. I've found my team often avoid standing in it, or the delay is so long that my team or the team-fight has moved on. While the healing amount of Abundance is high, you need to ensure you encourage your team to actually make use of it. If you can, try to always cast it near your team and somewhere that's easy for them to reach. Too far from where they are and the heal will be lost, and you'll be looking at a lengthy cooldown. Flame Buffet (E) - Although the DOT damage of Flame Buffet isn't huge, it's the slow and cleave that brings its primary value. If you can, you need to ensure you're applying Flame Buffet to as many enemies as possible, with a view to applying it twice. The low cooldown and lengthy duration (alongside a fast projectile speed) makes it relatively easy to achieve. If you can, always try to apply it onto the enemies Warrior so that their movement is severely restricted. The 40% slow, repeatedly applied, can be so frustrating to deal with. Life Binder (R) - Although it's not my preferred Heroic, Life Bender is fantastic at supporting a single Hero who's under heavy pressure. While it sounds a little complex, it's fairly simple: whomever has the most health, will restore the other after an initial and rapid heal over time. If you're full health and heal an opponent near death, their health will zip pretty much to full. If you're almost dead, and use Life-Binder an an ally who's almost full, your health will be restored. As a near instant means of healing yourself or an ally for a considerable amount, Life-Bender can be fantastic versus a dive composition. It's also great when you've a solo Warrior. Cleansing Flame (R) - Without doubt my preferred Heroic, Cleansing Flame allows Alexstrasza to leave the Battlefield and bombard allies and enemies. Allowing her to heal for a significant amount, or to deal high area damage to opponents. Used after your Trait, the damage and healing is enough to force enemies back or to finish low health Heroes off. The healing is also significant and if your team is grouped, is a far stronger method of keeping them all up than relying on Life Binder. Cleansing Flame is also solid for allowing Alexstrasza to escape when she needs to. Allowing Alexstrasza to reduce the cooldown of Gift of Life by 100% when she's above 75%, Live and Let Live is easy to maintain as long as you position well, and ensures your healing output is significant. Surge of Vitality allows Alextrasza and her Abundance to grant 30% movement speed for 3 seconds when her heal erupts. For retreating, or diving after a heal, it's amazing for ensuring survival and chasing opponents down. Lifeblossom allows Alexstrasza to leave a Lifeblossom at Gift of Life's location, if she's above 75% health. If she collects this, her next Gift of Life will be free, ensuring she loses no health to cast it. Offering damage, healing and utility, Cleansing Flame is ideal for group fights. Although it removes Alexstrasza from the fight, the damage and healing potential is huge. It's also fantastic after she has used her Trait. If you need burst healing, take Life Unbound. The fact the active ability heals an ally for 15% of their maximum health instantly, while also causing AOE damage is fantastic in a team fight. Building on your level 1 Talent, Draconic Discipline allows Alexstrasza to extend the duration of Dragonqueen by 7 seconds. Bringing the total duration to 22 seconds, it's a ridiculous length of time for her to receive all the benefits that she does. Variable: If you've taken Live and Let Live at level 1, Tough Love can also be a good pick here. It allows Alexstrasza to grant 20 armor onto an ally affected by Gift of Life as long as she's above 75% health. As long as you're maintaining your Flame Buffet, you shouldn't struggle to keep the armor application. On Ruby Wings allows Alexstrasza to gain her Trait upon landing, if she heals and/or damages 8 Heroes with her Heroic. It's fairly easy to achieve during a team fight, and the extended Trait upon landing (15 seconds) ensures she brings massive value. This list of tips and tricks are just a handful of things we think will help your Alexstrasza play. We'll continue to add to the list as required and if you have any tips you'd like to share, let us know in the comments below and we'll place them here. 1. Only use Dragonqueen in a team fight. It's totally pointless to use it at any other time, as its cooldown is huge. 2. Remember that Dragonqueen boosts all your abilities, or gives them different utility. Make use of this new output for as long as your Trait is active. 3. Your basic attacks deal significantly more damage in Dragonqueen form. Don't be afraid to play aggressively when transformed as your attacks cleave. 4. Don't constantly use Gift of Life to top-up low health Heroes. You'll lose 15% of your health regardless of theirs. 5. Remember that Gift of Life is at its strongest when you're above 75% health. You want to be maintaining your own health through Preservation/Flame Buffet (with Talents). 6. It's worth pinging on the map when you place Preservation. Players aren't always aware that they need to stand in it, in order to gain its healing. 7. Be careful when casting Preservation. The animation is a beacon for enemy players to throw attacks at that location. 8. You should constantly be casting Flame Buffet. It doesn't cost much mana, has a good range, and the DOT can make life challenging for any Support Hero. 9. Always try to land Flame Buffet twice. You need to trigger the slow on key targets so that your team can punish them. Triggering the slow is also your only means of defence. 10. When in Dragonqueen form, you can use WIng Buffet to send enemies into a corner in order to allow your team to jump on them. You don't have to use it purely for defence.